I really mean WORLD’S BEST!!! This World’s Best Steak Marinade recipe is so delicious that you will make it for years and years to come. Can be used on any red meat. 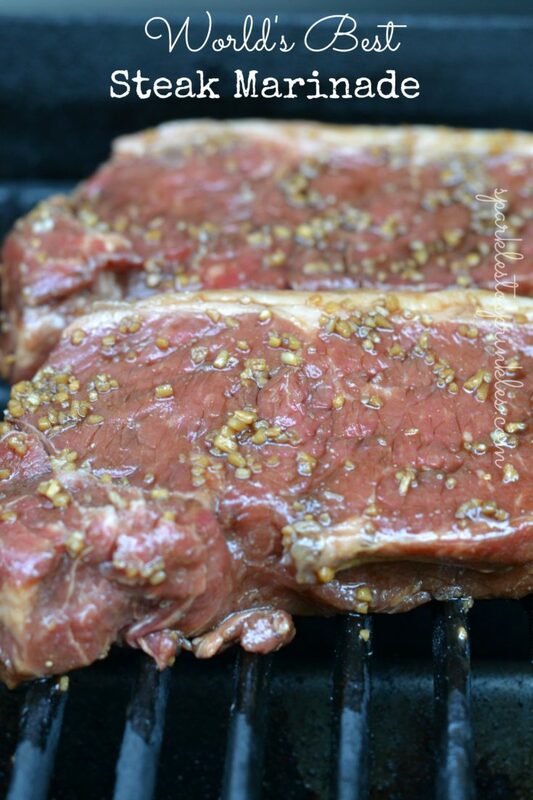 You can whip up this steak marinade in minutes, and let me tell you first hand it is the best steak marinade we have ever used. You will make it once and then walk around like a proud peacock at the fantastic job you did. People will be begging you for the recipe because it is THAT good! This marinade only requires a handful of ingredients, soy sauce, balsamic vinegar, garlic, honey and more. These ingredients marry nicely and the longer you let your steak marinade, the more flavor will work in, and offer an even juicier and flavorful steak. You can use this on all cuts of red meats; prime rib, t-bone, filet mignon, sirloin, flat-iron, skirt steaks, etc. You name it, this marinade works. It makes the meat so flavorful and tender, and it melts in your mouth. I also have a delicious pork marinade recipe that will knock your socks off. This steak marinade is genuinely the only steak marinade you will ever need. I have tested a ton of marinade recipes over the years, and we always come back to this recipe. We have been using this recipe for years, and it never disappoints us. A mix of savory and a hint of sweet that helps give your steaks that perfect crust when you grill it up. You can marinate as little as 30 minutes (which is the perfect amount of time to prepare yourself a Cuban Breeze Cocktail), but I like to do at least 3-6 hours for the maximum flavor. But let’s be honest I don’t always have things planned ahead, so a quick marinade is what I have to do. Regardless this steak marinade is one delicious pairing for your steaks. My steaks looking all yummy but very lonely. Double and triple when necessary depending on the amount of meat. For the meat pictured above, I doubled my recipe. Mix all of your ingredients together. Set aside some marinade to use for dipping after the meat is cooked. Place meat into the marinade and give it as much time as possible to marinade. SO easy to make this! WOW! Thanks! We love steak and just by reading the ingredients it sounds fantastic! I can’t wait to try it! 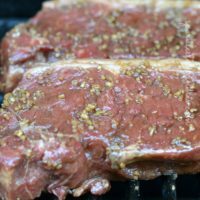 after you marinade meat is it safe to return meat to marinade after meat is cooked?? To make the leftover marinade a bit safer I decided to reduce it on the stove to use as a sauce, and it turned out delicious! That sounds delicious! Awesome idea! Re-using a marinade is dangerous. Best to withhold a bit for basting. Unless you heat the used marinade on the stove. Beef poses less threat than say pork or poultry but still not a good idea to get into the habit of doing. Nice marinade. I used it on some lamb I grilled. Will try it on some steaks next. I will definitely try the marinade. I was wondering, what is the optimal amount of time to marinate the beef – a few hours, overnight in the fridge or other. The longer you can give it, the better. But I usually only give it about a 1/2 hour since with 4 boys I am often last minute.. and it is amazing!! 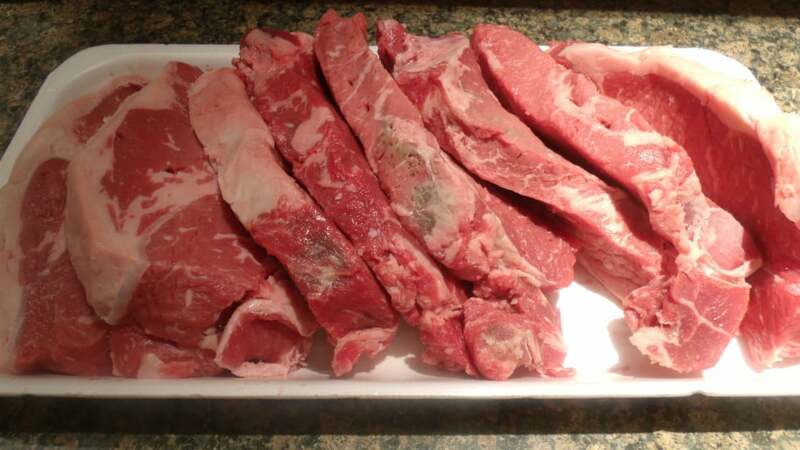 What do you recommend as the best way to cook the steak with the marinade….grill, oven, or stove top. Made this today, my husband and I loved it. So far best marinade to date. Thanks for sharing. I mixed your marinade in when i formed my ground chuck into patties, let them sit for 20 minutes, then grilled them @ 500-550 degrees till medium. Wow. I made 1/2 the recipe . I marinated a Top Round steak I got on sale . I only marinated it for an hour and it tasted great !!!! I sliced it thin and it was juicy and tender Yummy . Thank You I have saved this recipe on Pinterest . It’s a keeper !!! My husband told me to never use another marinade but this again! We had this tonight, the balsamic vinegar gave it an interesting flavor…not sure it was my favorite but it was good. I’d suggest blotting the steaks before searing, I forgot and ended up with very charred rather than a nice crust using my cast iron skillet. This marinade is amazing!!!! I have made it several times and everyone loves it! So easy to make. The longer it sits the better it gets!!! I am so happy you love it! This is our favorite!! We can not get enough of it. I don’t have balsamic vinegar on hand. Any substition recommendations? This truly is the best marinade. It easy and forgiving. I didn’t have worcestershire sauce at home but I tried it anyway and it was still amazing! Going to try it out tonight, i’ll Let you know how it turned out.